Tunisia's Chahed names new cabinet after tensions - The Maghreb Times ! Tunisia’s prime minister named a new cabinet on Wednesday, appointing one of his advisors from the Islamist Ennahda party to a new economic reforms ministry in a deal that ends weeks of infighting over posts. 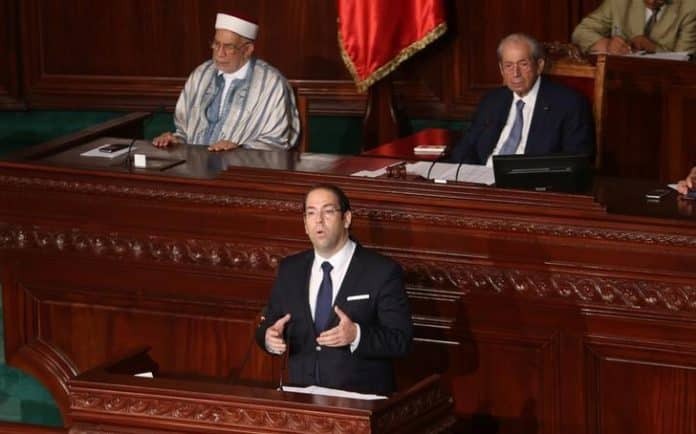 The compromise cabinet should give Prime Minister Youssef Chahed the impetus to push ahead with tough reforms of public sector wages the pension system designed to improve Tunisia finances in line with IMF demands. Chahed, in power for just over a year, restored Ridha Chalgoum, a former finance minister close to the ruling Nidaa Tounes party, to that ministry. Six years since the 2011 uprising that ousted autocrat Zine El-Abidine Ben Ali, Tunisia has been held up as a model by avoiding the violence that affected other nations after their “Arab Spring” revolts. However, successive governments have struggled to enact fiscal reforms that have been delayed by political infighting and government wariness of social tensions over jobs and economic conditions that helped spark the 2011 uprising. Nidaa Tounes allies were appointed to six of the 13 cabinet changes. Ennahda kept three posts and the new economics reforms portfolio. Nidaa Tounes hardliners had been pushing Chahed hard for more representation in the cabinet to better reward their 2014 election victory, while rivals in the power-sharing government pushed back. Ennahda said the party saw no reason for a major overhaul other than filling vacant minister posts. Political squabbling and Tunisia’s compromise-style politics to maintain stability have in the past delayed economic reforms as parties jockey for position. This week the powerful UGTT labor union warned it could intervene as mediator, something it has done in past when tensions between secular Nidaa Tounes and Islamist Ennahda threatened to scuttle Tunisia’s young democracy. “Chahed’s deal with Nidaa Tounes and Ennahda is likely to ease tensions and to boost government stability,” said Riccardo Fabiani at Eurasia Group. “After scheduled local elections in December, this relationship is likely to gradually deteriorate again as tensions rise ahead of the 2019 presidential and legislative ballots,” he said. Tunisia PM pushes broad reform package, talks with unions.